- der stamm der minks greift sie an. Kanjuro explains that Raizou is a Tetetete, a running ninja. Luffy & co dodges the ape, but Kin and Kan is fooling around with pretend ninjutsu and is knocked off the dragon. Luffy and others wants to go back down to the ocean to pick up the samurais, but they yell out that they're fine, and will catch up later. Luffy yells down to the samurai that they'll go on ahead, and we'll meet up later. The dragon smiles and slowly reverts to a painting as Luffy & co tearfully calls out his name. Franky cries. Zoro & Law is uninterested, calling this a farce and just a terribly drawn painting. They head to a large castle wall arch with a carving that reads "Mokomo Dukedom" to enter the nation, while Robin puts a flower on Ryuunosuke's drawing. Luffy climbs up the wall and on the watch tower to get a good view of the nation. The nation is large and well developed, with massive blocks of buildings that resemble thin cliffs, large cities around a ruin, vast forests, river, etc. Despite being on an elephant, it's completely an island nation. They walk through the arch, as Zoro mentions the gates are open. But Law points out that the gates didn't just open... it's missing, someone had forced themselves in. Inside the gate, the party finds massive destruction through the forest. And the destruction is still new. The road is hard to walk on, as they're treading on the skin of an elephant. Luffy reaches the city, but it looks abandoned. Buildings are destroyed. Luffy yells out his friends names "Sanji, Nami, Chopper, Brook! Gas... well nevermind I don't care about gas. " Franky notes the smell of gun powder and gas, while Usopp is frightened to know what happened to this place. Zoro and Law notices someone approaching, and Zoro readies his sword. A small bunny girl rushes towards Zoro, and Zoro slashes at her, but she changes her direction in mid air, easily dodging Zoro's sword and counter attacking. Zoro unsheathes his other sword with free hand, catches her claws, but upon contact is electrocuted! Another mink woman riding on back of an aligator (or crocodile) tells the bunny girl Carrot to stop, those are not the men they're after. 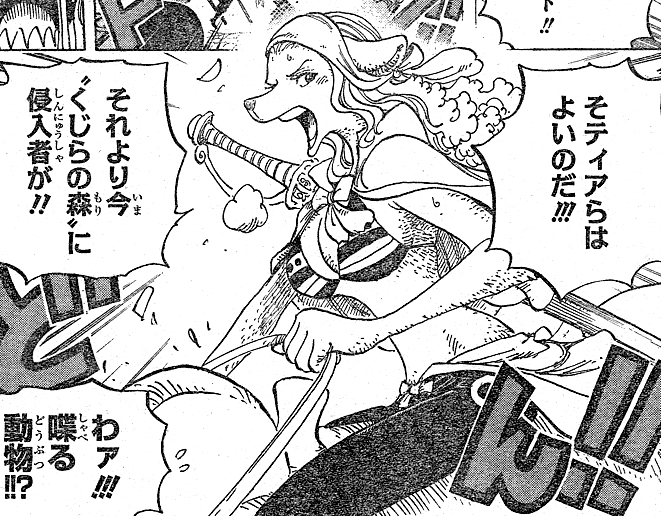 The woman wears Nami's clothes, and tells Carrot intruders are at the Whale Forest.